A 22-year-old female presented with darkening of skin of the right side of the face. It was first noticed at the age of three, which was in the form of blue-brown dots over the right cheek. The darkening has been progressive and has taken the present dimensions. On examination, there were bluish to brown coalescing macules involving the right side of forehead, malar region, root, bridge, alae, and dorsum of nose with sparing of the periorbital skin [[Figure 1]a]. The superior and inferior sclera of the right eye, adjacent to the limbus, revealed bluish discoloration [[Figure 1]b]. On examination of the left side of the face, a few scattered brown macules were noted on the alae and dorsum of nose and similarly on the malar region [[Figure 2]a]. The sclera of the left eye [[Figure 2]b] also revealed presence of a few bluish spots which raised the suspicion of the condition being bilateral. On examination of the oral cavity, bluish-grey patches involving both sides of the hard palate were noted [Figure 3]. Hence, a diagnosis of bilateral nevus of Ota was formulated. A clinical image comparing both sides of the face within a closer range helps reveal the bilateral nature of the condition [Figure 4]. 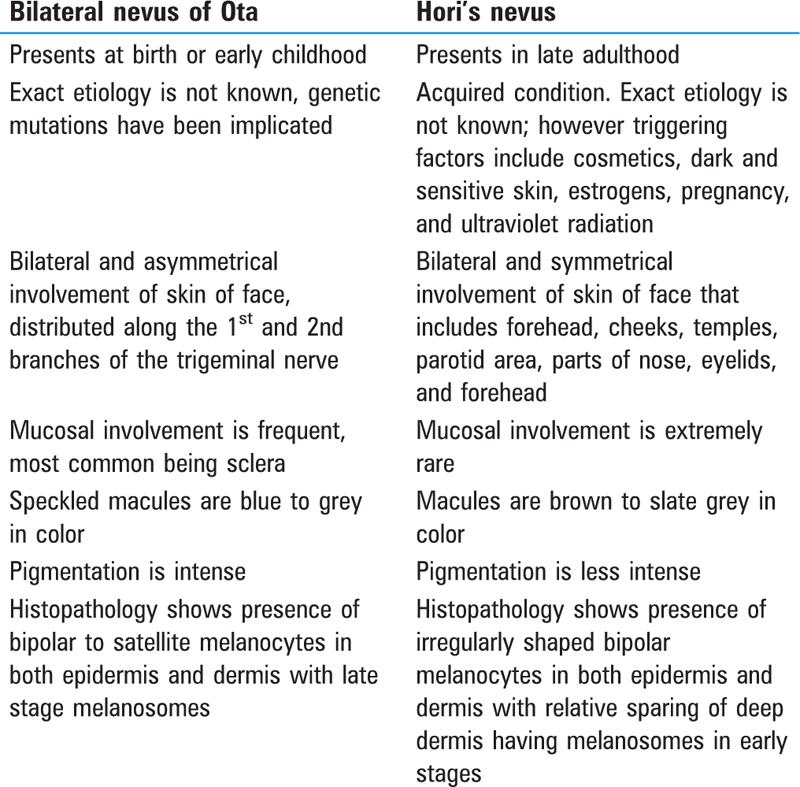 Bilateral cases of nevus of Ota are uncommon. The sparse involvement of the contralateral side of the face made our case further unusual. An examination of the oral cavity was crucial to arrive at a conclusive diagnosis. Acquired bilateral nevus of Ota-like macules (ABNOM) or Hori’s nevus was a close differential diagnosis. The two conditions can be differentiated clinically (refer [Table 1]). The patient was requested to undergo a skin biopsy, which was denied. She was counseled about the prognosis and role of laser in treatment, which unfortunately is not available in our center. The patient was further referred for ophthalmic evaluation. Nevus of Ota is also known as nevus fusco-ceruleus ophthalmo-maxillaris, because it primarily affects the skin of face adjacent to the eye, distributed along the 1st and 2nd branches of the trigeminal nerve. 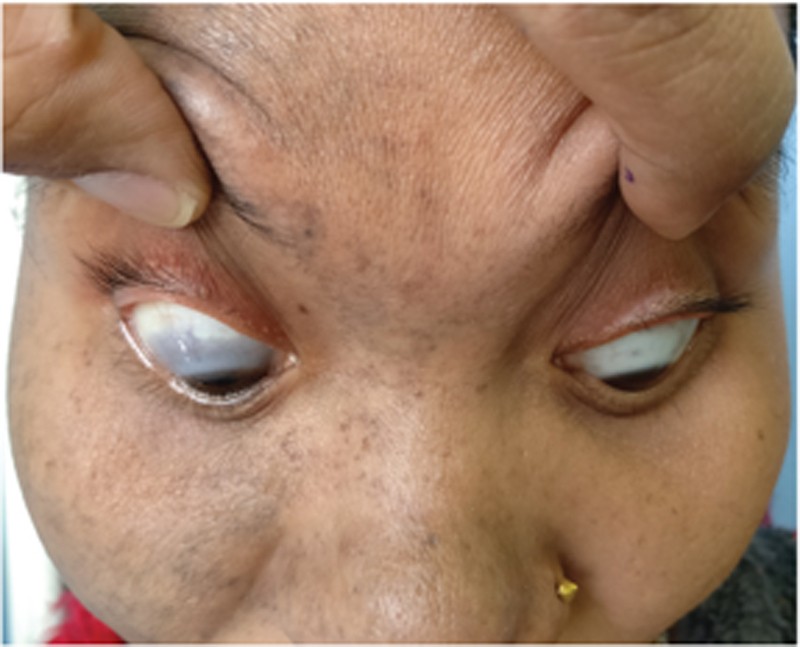 Sclera is unequivocally involved and hence the synonym “oculodermal melanocytosis.” Ocular complications include glaucoma and melanoma and hence, ophthalmic evaluation is a must. Extracutaneous lesions can be seen in the oral mucosa, which further gives this condition, a third synonym “oculomucodermal melanocytosis.” Skin lesions are permanent and cosmetically worrisome. Laser has been found to be effective; however, availability, cost, and duration of treatment are its limitations. Q-switched Alexandrite laser tends to be more efficient than the Q-switched ND:YAG laser. The authors certify that they have obtained all appropriate patient consent forms. In the form the patient has given her consent for her images and other clinical information to be reported in the journal. The patient understands that her name and initial will not be published and due efforts will be made to conceal her identity, but anonymity cannot be guaranteed. Junejo MS, Khan MS, Mukhtar A. Ocular features in a case of nevus of Ota. J Coll Physicians Surg Pak 2017;27:S56-7. Choi JE, Lee JB, Park KB, Kim BS, Yeo UC, Huh CH et al. A retrospective analysis of the clinical efficacies of Q-switched Alexandrite and Q-switched Nd:YAG lasers in the treatment of nevus of Ota in Korean patients. J Dermatol Treat 2015;26:240-5.